There is no question that the upcoming election will largely be a referendum on the economy and the Obama administration’s abysmal management of it. And there is no question that Republicans should have no shortage of ammunition with which to hit the Obama administration, including numerous promises which the president has failed to keep. However, there is one significant promise the president has failed to keep which has garnered relatively little attention and which the Republicans will never mention (nor should they). Yes, ladies and gentlemen, nearly three full years after President Obama signed an executive order for its closure, Club G’itmo is still open for business. We continue to house some of the world’s most dangerous terrorists, sorry, “enemy combatants,” (no wait, I can’t use that term either… er, religiously-motivated and impassioned activists) at that tropical location. Of course, the fact that the detention facilities at Guantanamo Bay remain open must irk the Left more than I can even begin to imagine. After all, this is where we commit all sorts of atrocities against the captured subjects. They are undoubtedly struggling to survive while watching big screen televisions and dividing bulk meals amongst themselves (and saving the rest for later). 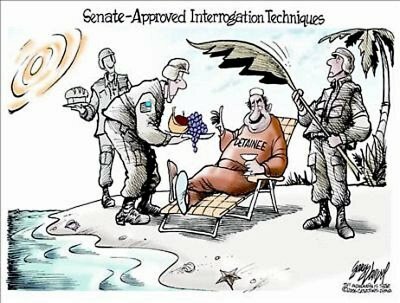 One of the most repeated arguments against Guantanamo is the occasional use of enhanced interrogation techniques against select detainees to gain information. Critics decry techniques like waterboarding, calling them torture. The fact that there is still a debate over whether waterboarding is torture astounds me. When many more journalists have willingly submitted themselves to the treatment than the number of times it has been used against detainees in interrogation to prove it is torture, it is clearly not torture. A sane individual would never willingly submit himself to torture. Chopping off a finger or injecting pepper spray under the toenails is torture; waterboarding is not. Nor is it used nearly to the extent the Left would have you believe. The reports about the 83 (or 183, depending on the source) incidences in which it was done to Khaled Sheikh Mohammed and other individuals are absolutely false. And the former CIA director, Leon Panetta (whom Obama appointed, no less), admitted that enhanced interrogation techniques have produced good intelligence… but excuse my tangent. Policies have been enacted with regard to respecting the faith and practices of the detainees. Each detainee is given a Koran in their language, and a surgical mask. The surgical mask is used as storage for the Koran. It is hung from the wall in the cell of the detainee. There is a recorded call to prayer that is broadcast five times a day. During the broadcast, a yellow traffic cone, with a big “P” stenciled on it, is placed at the center of each cell block. This is a signal to the guards to maintain a respectful silence while the detainees are praying. There are also arrows around the camp that point in the direction of Mecca. Certain “comfort” items are provided to detainees that comply with the rules of the camp. These items include a prayer rug, perfume oil, and prayer beads. Of course, the Washington Post cries over the president apparently “caving” to political pressure and that the administration did not push hard enough for its closure. Indeed, the White House did face steep opposition to the closure of the facility from Congress. However, that opposition was backed by the American people. A majority of Americans believe that Guantanamo should remain open. Could it be that the administration was actually listening to the American people? It must be a coincidence. There were reports circulating recently that the administration was considering a deal to release high-ranking Taliban leaders from Guantanamo in exchange for peace talks. That is very problematic considering the nature of many of the leaders, most of whom were field commanders and liaisons to Al Qaeda. The administration has denied the deal, and I certainly hope it is telling the truth. Given the already alarming recidivism rate out of Guantanamo Bay, we cannot afford to release these despicable individuals back into the fight. Yes, Guantanamo is still open, and it should absolutely stay open. It is more than sufficient to meet our needs in terms of detaining and trying those who are attempting to kill American troops and civilians. Just don’t say that too loudly. We actually don’t want the administration to follow through on this one. I must disagree. It’s time to give these detainees a proper trial and either send them to prison or send them on their way.